Celebrate the 90th birthday of one of the world's most beloved icons of children's literature, Winnie-the-Pooh! Whether you’re six, sixty-six, or anywhere in between, this enchanting collection of verses about Christopher Robin and, of course, Winnie-the-Pooh, will enchant. Filled with gentle humor and playful rhythms, Now We Are Six contains some of the best-loved poems for children. Between its pages, readers will delight in the always accessible, sun-filled realm of the imagination, perfectly rendered in Ernest Shepard’s beautiful illustrations. 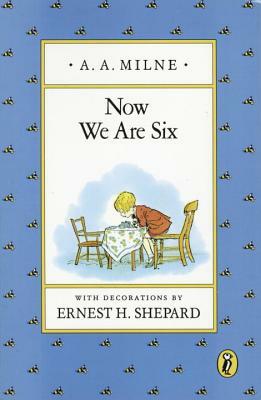 The essential book for that all-important birthday, Now We Are Six is a classic in its own right, treasured by every new generation of readers.